IF YOU HAVE ANY CHILDREN or care for an elderly relative, increase your sense of security by having them carry a GATEWAY MEDICARD® Medical Emergency Data Card at all times. List yourself as the next of kin on their card and feel reassured that you will be contacted in case of an emergency. Feel confident that your loved one's caregiver will be given accurate basic medical information immediately; information that is sometimes difficult to remember. 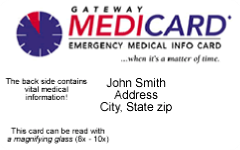 Additional immediate family member GATEWAY MEDICARDS® are available for only $5.00 each. To request additional family member cards, simply complete and mail an additional form for each member to your GATEWAY MEDICARD® Customer Service Office.